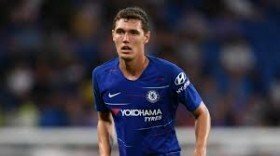 Former Chelsea star Michael Essien believes Andreas Christensen could push for a winter departure from Stamford Bridge after struggling to garner regular gametime under Maurizio Sarri this term. The Denmark international made 40 appearances during his breakthrough campaign last season and out of those, 27 came in the English top-flight under the guidance of Antonio Conte. However, with the change in management, things have gone pear-shaped for the highly-rated Dane and Essien fears that this could urge him to pursue a fresh challenge elsewhere. "Every player wants to play [at Chelsea]. When you’re not playing you get frustrated and you want to look elsewhere," he is quoted as saying by Goal.com. Christensen had been linked with a probable switch to Barcelona earlier in the month but the Spanish giants have since swoop for the signature of Jeison Murillo from Valencia. Still, the speculation regarding his future does not seem to cease with his father and agent Sten recently suggesting that the defender could seek a permanent exit from the Bridge in January. Christensen has largely featured in the Europa League and League Cup matches this term. He has managed a single league appearance in the away defeat at Wolves.